Last time we covered something from iHome, it was their new iHM10B Portable MP3 Player Speaker System. Today is it is the iHMP5 Series, which is something that I have been seeing more and more of these days: a speaker system/headphone combo. 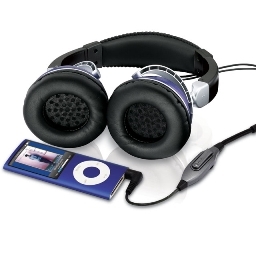 The iHMP5 Series is designed to work with all sorts of music players which include the iPhone, iPod, laptop, and just about anything that has a headphone jack. You put them on your head to enjoy the music in private, and put them down to share it with their friends. That sounds like the slogan for the product, doesn’t it? I actually made that up myself. Of course, you could probably do the same thing with any stereo headphones, maybe even a pair of earbuds and then crank the volume to 10. Apparently, what makes the iHMP5 Series work is that it has a “magnetic proximity switch which activates the power amplifier and kicks the music to room volume”. I know for sure that I have reported have reported on another pair of headphones that double as stereo speakers before, but I cannot remember the name. If you know any other headphones/stereo speakers out there, feel free to put them in the comments. If you are looking for a product like this, feel free to head over to the iHome site and lay down $69.99 in silver, red, and blue. CBS and Pepsi Create Video Ad, for a magazine?